Eurocom has recently launched and is now testing and shipping the thin and light, M5 Pro with a choice NVIDIA GeForce GTX 980M and 970M graphics, 32 GB DDR3-1600 memory, 4 TB storage, a stunning 4k (3840x2160) 15.6” display and an Intel Core i7 4710HQ processor. If there was ever a laptop that could blur the lines between ultraportable and gaming it would be the EUROCOM M5 Pro, powerful enough to run current and future games at ultra with the weight, dimensions and battery life of an ultraportable. The EUROCOM M5 Pro is Eurocom's newest innovative creation. A lightweight 2.6kg laptop with superb performance. It is powered by the next generation of world's most powerful NVIDIA GeForce GTX 980M and 970M graphics and features a beautiful 4K, 3840-by-2160 pixels display. The EUROCOM M5 Pro is extremely thin and mobile while still offering a stunning 4TB of storage with four physical drives with a combination of traditional SSD/HDD as well as new, innovative M.2 slots. Sleek, slim, super high performance, the M5 is another "little monster" from Eurocom that will blow everybody away, while gaming or doing your corporate bidding. 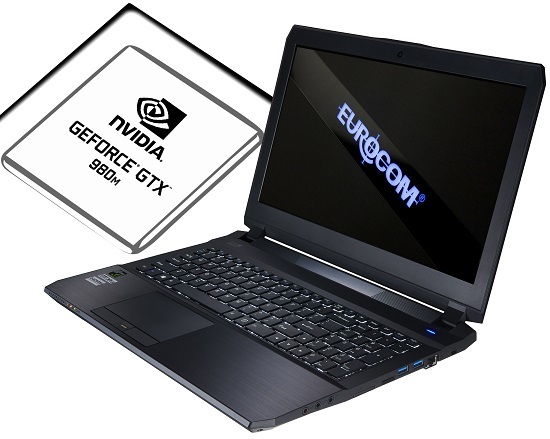 The EUROCOM M5 Pro supports both NVIDIA GeForce GTX 980M (4GB DDR5) or GTX 970M (3GB DDR5) graphics for unbeatable performance, raw power and great battery life. The NVIDIA GeForce GTX 980M’s 1536 CUDA cores, running at 1038 MHz and 8 GB of GDDR5 memory running at 2500 MHz offers 50% faster performance than the previous generation NVIDIA GeForce GTX 880M. Experience great notebook graphics performance with next generation NVIDIA GeForce GTX 980M and 970M Maxwell graphics for advanced performance, unmatched power efficiency and cutting edge features. An Aluminum Alloy Chassis is used to offer a durable, rugged yet classy look while offering a very lightweight and strong 2.6 kg case that is just one inch thick. The Aluminum also provides heat sink qualities, which allowed Eurocom to put such high performance NVIDIA GeForce GTX 980M and 970M graphics and other components inside the M5 Pro. The EUROCOM M5 Pro supports four physical drives by way of two optional M.2 2280 SSDs and one 7.5 mm and one 9 mm storage bays, with RAID 0/1 support. A fast and powerful M.2 2280 SSD is ideal for Intel’s Smart Response SSD-caching and Intel® Rapid Start technology. Intel Smart Response is an intelligent caching setup that monitors data reads and writes on your system drive and caches the most frequently accessed data to an SSD. This results in a significant speed boost, as the data is ready for when your system needs it. RAID 0/1is also supported for increased performance or redundancy. Intel® Rapid Start Technology enables systems to quickly resume from deep sleep in about 6 seconds. The EUROCOM M5 Pro has an Intel HM87 Express Chipset running the Intel Core i7 4710HQ processor with 4 cores, 8 threads running at 2.5 GHz with integrated Intel® HD Graphics 4600. Due to Hyperthreading, the four cores can handle up to eight threads in parallel leading to better overall utilization of the CPU. The i7-4710HQ is rated at a TDP of 47 W including graphics card and memory controller. The EUROCOM M5 Pro has 4 memory slots ready for up to 32 GB of dual channel DDR3 1600MHz or 1866 MHz 204 pin SODIMM. With such massive amounts of RAM available, the M5 Pro becomes a flexible tool for virtualization and high performance computing. Being fully upgradeable the EUROCOM M5 Pro supports 8 GB, 16 GB, 24 GB and 32 GB of memory via 4 or 8 GB modules. The EUROCOM M5 Pro comes with a full size backlit keyboard with separate numeric keypad. The adjustable white backlit keys help to increase usability in dim lighting conditions by ensuring users can see the keyboard in nearly any environment, while also hinting at the epic power under the hood. All features in the EUROCOM M5 Pro are powered by a 180W AC adapter so the M5 Pro is ready to handle any workload. With a removable 4-cell 60 WH Polymer battery, the M5 Pro can deliver up to 3.3 hours of full power battery life.